The people of Newtown are asking that everyone commit random acts of kindness on December 14th in honor of the teachers and students. 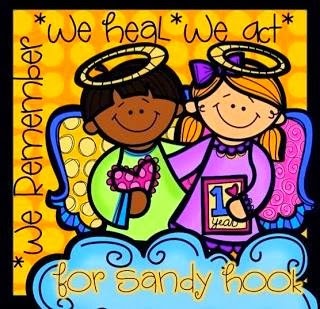 The blogging community is coming together to remember Sandy Hook by spreading their message and encouraging others to commit random acts of kindness. Have you ever paid for the car behind you in a drive-through? It's a delightful way to surprise not only them, but the cashier too. Try it with me this weekend... it's a favorite R.A.K. I enjoy doing. I love your idea, please could I ask for any of your daily maths packets. You're so generous, and thank you for the idea about the drive-thru. You're right...you don't get to see the person behind you's reaction, but the face of the cashier will melt your heart! When I looked at your store, everything looked so cute...hard to pick! But the item that I would like to request if I get picked is the 1st Grade Math Common Core Assessments for the Year. Thank you for your kindness. You are an inspirational teacher--teaching us how to be better both in the classroom and in our lives outside of the classroom. If chosen, I'd love to receive the "Sticking with Math Journals" bundle. Thank you. You are so generous! I would love your Math Common Core Assessments for the Year for 2nd grade. I love your drive-through idea. I'm going to try that the next time I go through one. I'm going to try the drive-thru thing next time I'm at chick-fil-a! In all my time working at mcdonalds, I never saw a customer do that! I've been wanting to try your "Teacher, I'm Done!" Task Cards for January. They look great for fast finishers!! You're wonderful! I would love your 2nd grade Daily Math (any term).